I'd been in a rut the past couple of weeks feeling a little uninspired and unblogworthy (not a word but it fits, haha) when to top it off I received a couple of very mean comments on several recent posts which some of you may have seen before I had chance to delete them. I can be a sensitive soul at times so it did knock the wind out of my sails a little and I took an impromptu blogging break . . . . So without further ado I'll get down to business and show you this weekend's treasure huntin' spoils (mentally added a pirate voice at the end there). Wedgwood! 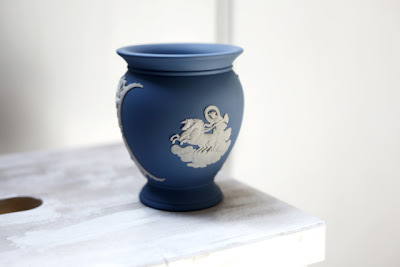 Cannot express how much I adore their jasperware, especially in the classic blue and white although I have seen some gorgeous green and salmon coloured pieces too. Generally you can find me hanging out in a local antiques shop, my face pressed against the glass of the display cabinet ogling whatever jasperware they have on offer. But as luck would have it Age UK and Cancer Research both came up trumps in the Wedgwood stakes yesterday! I'm still doing the magpie thing when it comes to all things blue and white; hoarding knick knacks and fabrics to use in the bedroom. This little trinket dish was the Cancer Research find at £4 and I can already picture it looking lovely somewhere, possible hung on the wall in a little nook above one of the large beams. The little vase was slightly more pricey at £4.99 from Age UK but still a snip for Wedgwood so was whisked to the checkout pronto. This was my only table top sale bargain; what is it with me and glass? I have a problem, I'm a junkie but I like it. 50p from a lady with a full bouffant 'do and Pat Butcher earrings, sounds like a car crash but somehow it worked on her! It's a ginger jar-type shape but I like to think of it as a biscuit jar a la Lady Sybil of Downton Abbey, delusions of grandeur aside it will probably play host to some dried lavender. Couldn't pass up an old copy of 'Women In Love' by D.H. Lawrence, classed as a little racy in it's day there was plenty of controversy surrounding the novel and it's predecessor 'The Rainbow' although we'd consider it a little tame when compared with contemporary literature. There was a recent BBC adaptation of the two books merged into one mini series back in March but I missed it, so at £1.25 in Mind I treated myself. 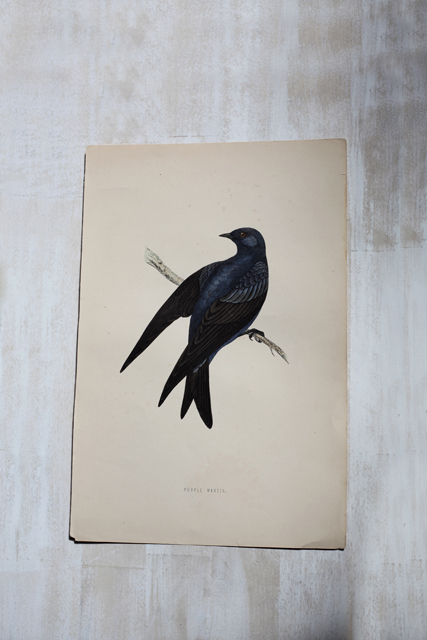 There's a little gallery type print/framing shop in the oldest part of town which is full of some gorgeous images, though being the thrifty chick I am I tend to rummage in the boxes outside labelled '£1' which is where I found these two little bird prints, one of a Martin the other a Purple Martin which I think must have come from a book at some stage. 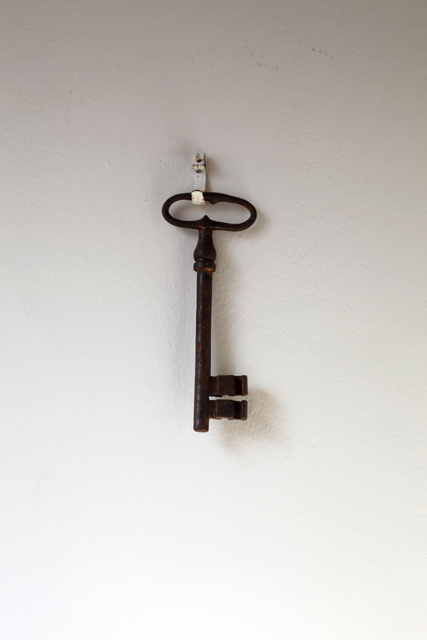 Last but not least was a big, gorgeous old key I've hung at the top of the stairs where the light streams in through the Velux window. There was a large box of these and it took a bit of rummaging to find 'the one' but it was worth the time, I can't help picturing it opening a hidden door or a secret chest somewhere. It was £32 for the whole box of about 25 but I'd set myself a strict budget (stupid girl) and stuck to it - small victories! Hope you are all well and have been enjoying the weekend! You are certainly not unblogworthy, Jem. Shocked to hear about the mean comments. Some people are plainly very stupid. Ignore them and they'll go away. Love the bird pics and, Scarlett is right, the key does look magical. Hi, new visitor over via Flea Market Finds. 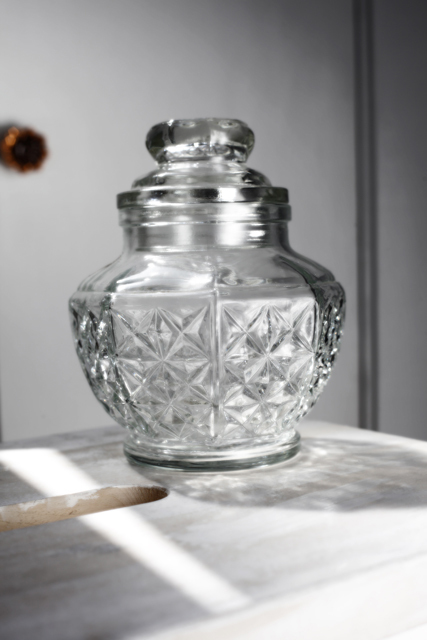 I love the glass jar and the key. I think I remember something similar at my parent's house, I'll have to steal it next time I'm there! sod 'em Jem,though I do know how you feel,blogging is great but in someways you are puttingyourself out there, it's not nice if people are really negative.constructive criticism can be helpful but being unkind is just rude,youll never please everyone but if people dont enjoy a blog they should just stop reading -simple! p.s your blog is easily one of my faves so I'm v glad you're back!! Your blog is full of lovely finds, is well written and beautifully photographed so I can only assume someone was jealous. And of course some people are just fuckwits! Delete and move on - you've loads of friends here. 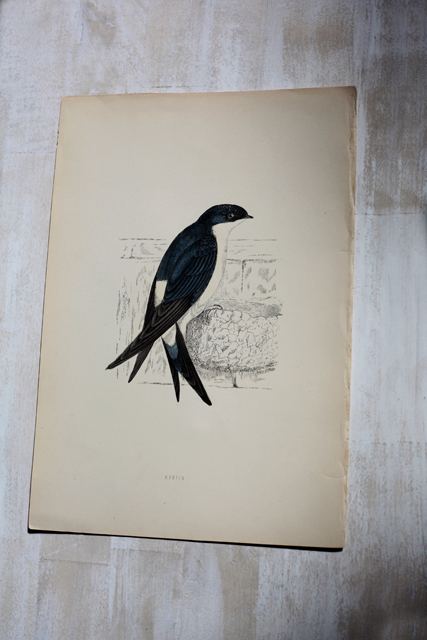 I love bird prints too - those are beautiful and the key is amazing, there's something very Jane Eyre or Secret Garden about it. So glad you've put the idiotic negative comments behind you. Your blog is so well presented it feels like reading an article from an expensive home magazine. Like Lakota said-jealousy has a big part to play. The key is so dramatic, it does leave you imagining all kinds of romantic settings! Superb, classy finds Jem. Top notch. As for the troll, well, some people are full of hatred and spite and only know how to spew it out in vile torrents. The internet is such a vast place we're bound to bump into the nasties occasionally. And it does make for a bad feeling, I know. If it ever happens again you should shout it out and you'll get a lot of support here - which will help you put the nastiness behind you. I’m with Lakota on this, and we have a saying in our house: “Don’t let the bastards grind you down!” Like we used to day to the kids: “If you ignore them they’ll go away...they really aren’t worth the bother!” Good to have you back. Beautiful finds. Especially loving the bird prints and key. I like all of your treasures, but the bird prints most especially. Dear jem take no notice of those anonymous people they are everywhere causing dramas as their life is so dull.Just keep blogging as you have lots of people who love reading all your posts.I LOVE that key you found too. would someone leave you a nasty comment? I don't get it! The Key is my favorite of your finds. My husband brought home some keys that no one uses at his work anymore, and I can't wait to use them for something cool. I adore those two bird prints, I collect them but don't see them too often! The giant key is amazing, I definitely would have scooped up the whole box (but then again I'm insane about keys). i'll say! there's always naggers around, and they leech. do not let them get to ya. i've enjoyed your post so much. i don't think i've been here before. that wedgwood, yam! the women in love has got to be interesting, and i think i missed the series too, though i saw the trailers, i now think. oh well. i'm loving every image you offered. Visiting from Apron Thrift and I'm so sorry to hear of the hateful comments. Just let them roll off your shoulders (easier said than done, I know) but don't let it get to you. There are some people who don't know how to be nice. They themselves are miserable therefore they must make others miserable. Sorry souls. On to your treasures. I love them all. I have to say I imagined that fascinating key opening a secret garden somewhere, full of the most magnificent blooms! I love the bird prints as well. I'm a big fan of birds. Great treasures and I'm so glad you shared them with all of us. You have a lovely blog. Don't deprive the rest of us because some fool has poor taste! Love those bird prints. I had some similar when I was a student (stuck up with bluetak rather than tastefully framed, sadly) and you've inspired me to go and find them to show my daughter. Thank you! Sorry to hear you've had a run in - some people clearly have nothing better to do! Onwards and upwards. I love your glass jar, the bird prints are beautiful, really beautiful. So glad you're back, so sorry you had to deal with unsavoury comments, some people should get a life! Screw the meanies, if they don't have the courage of their convictions to say who they are then they're not worth listening to, it's very easy to hide behind the 'anonymous' moniker. Yes, glad you are back. So enjoy your posts! Love your finds. The bird print love love. I'm drawn to paper items. 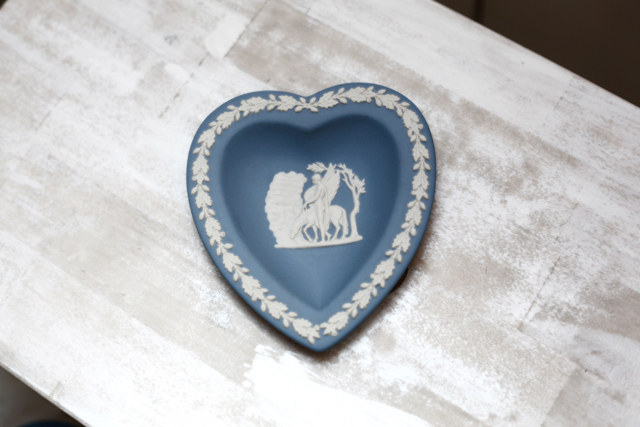 Jem, beautiful Wedgwood! Your finds are wonderful, and how sweet of you to send Miss Tea such nice gifts. I'm especially sorry to hear that you suffered at the hands of another suffering person. But I can see that you've wiped the dust off and are back in the saddle - good for you! 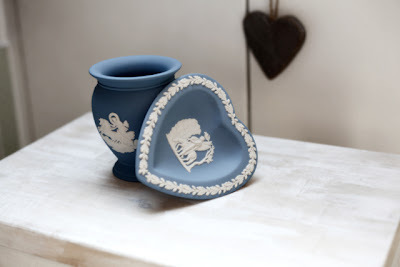 If you like Wedgwood, you might enjoy my February posts where I featured some lovely pieces....I don't have a big collection, but enough to suit me. Not sure what was said but ignore the trolls. They're not worth it.